We are located in the Maenam Beach area in the north of Koh Samui which is one of the most tranquil and relaxing area on the island. It is only a minutes walk from our resort to the beach, yet a 20 minutes ride will take you to Chaweng Beach, the center of Samui’s night life and restaurants. 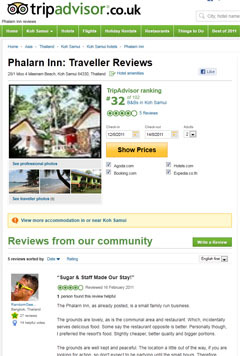 From Phalarn Inn Resort it is also only 15 minutes to the Samui International airport and the Nathorn town. Besides that: Phalarn Inn Resort is only 30 meters to Lomprayah Pier that provide the catamaran services to Koh Phangan, Koh Tao and Bangkok. The easiest way to get to Koh Samui is by plane. From Bangkok you will leave from Don Muang Airport. Koh Samui has a privately owned airport which makes flying to the island expensive compared with other destinations in Thailand. however it is by far the best an easiest way to get to Koh Samui ! The bus is easily the most economical way to travel, and an adventure in itself. You can buy tickets and board at the major Bangkok public bus stations, or if you are stopping at Khao San Road, you can catch an overnight bus departing in the evening, to all southern destinations including Samui. You will stop very early in the morning at Suratthani, which is the mainland access city to Samui, where you will transfer to another bus for the trip to the ferry that crosses to the island. A bus trip from Bangkok to Samui takes about 10 hours. You can economize by making the trip from Bangkok (or elsewhere) to Samui by taking the train, and if you have the time, it can be good fun. Most people opt for a second-class berth in a fan-cooled or air-conditioned compartment, while a private first-class cabin for two can be very romantic! Either way, the cabin service is usually quite good. Check out the Rail-Bus-Ferry tickets. They can be purchased at the train station in Bangkok. f you have a car or motorcycle that you wish to bring to Ko Samui, the car ferry service starts at 06:00 and operates simultaneously from both Donsak and Samui ferry piers every hour on the hour until 18:00. The ferry crossing takes approximately one hour thirty minutes. Monthly stay change to GET 30%discount !